He was right. I was a pretty good 400 meter runner in high school, and became a decent 800 runner in college. And while some of my runner friends still joke about me being a half miler, that was half a life ago. I haven’t run that race since college because I have never wanted to run the risk of not being able to say I’ve never not run an 800 in sub-2:00. The great thing about never having run a race over that distance in high school or college (with the exception of cross country and some road races) is that I’ve enjoyed a lot of PRs at longer distances during my adult life. Those that know me know I love the trails. That might have started with high school and college cross country (which I still love), but I think it was clinched right before I turned 30. After seeing some photos of the 40-mile long Timberline Trail around Mount Hood, I convinced a friend we should run it the next weekend. Not the smartest move, since he was fried at 30 miles – but we made it. Since then, I’ve run around Mt Hood, St Helens, and Mt Adams multiple times, as well as Mt Jefferson and the Three Sisters. 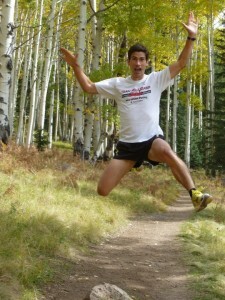 I even did a week-long stage race through the Rockies and ran a couple respectable marathons. I would still say the Timberline Trail is one of my favorite trails, and I have organized several TRL 3-day run and camp trips there. I still love running and being involved in the running community. Having been an active member of this club for more than a decade, and having spent more than a decade on the board of directors (including 4 years as president, 2 as vice president, and the others as Director of Communications), I believe in the mission of the club, love the people I’ve met through this organization, and enjoy spending time and energy working on club activities.